Interior Channel is a full-service basement waterproofing company. We realize that one system cannot fix all problems. Some basement problems are a direct result of the water table rising above the basement floor. 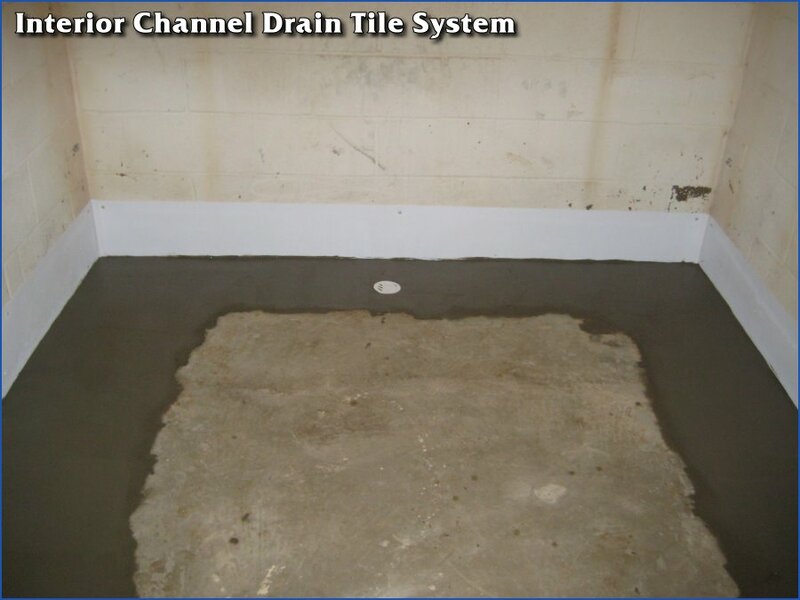 The most effective method to fix this problem under the floor is to install the Interior Channel Drain Tile System. The Interior Channel Drain Tile System is a comprehensive waterproofing system that collects water from below your basement floor and from your walls. The water is then drained to your floor drain or a Superior Sump System. 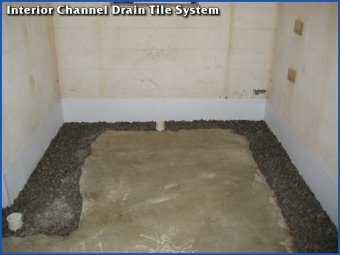 The Drain Tile System can be installed to all types of foundations including brick, block, and poured and stone foundations. Click on the images below for a bigger view. 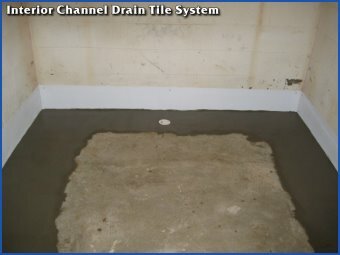 The Interior Channel Drain Tile System is a true sub-floor drainage system that is installed well below your basement floor. 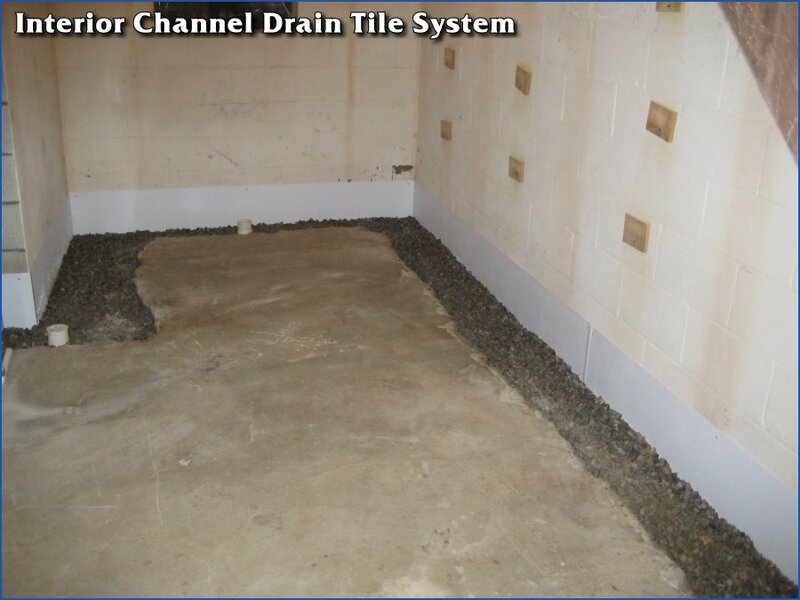 Not to be confused with box-type systems that are mounted on top of your footer, the Interior Channel Drain Tile System is actually in your floor. The Interior Channel Drain Tile System is suspended in new drain stone that is too large to enter the tile. This eliminates clogging from bad backfill and allows the system to be pitched downhill to the point of drainage, unlike box systems that sit level on top of your floor. Due to the depth of the Drain Tile System, water is collected prior to any contact with your basement floor, thus eliminating dampness and water seepage through floor cracks. Box-type systems cannot effectively eliminate a true water table problem because they are mounted on top of your footer and in your floor. 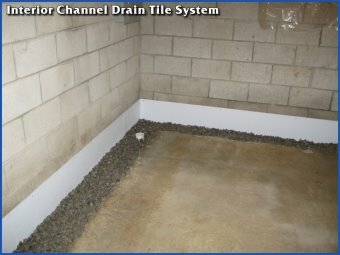 If you have a true water table problem, a true Drain Tile System is the best solution. In this day and age, Drain Tile Systems are actually required in new construction.